As you know the new release of IntelliJ IDEA finally comes with support for Play 2.0, a popular Java and Scala framework for web development. The support brings new project wizard, run/debug configurations and code assistance for Scala templates and routes, with code completion, navigation and on-the-fly code analysis. Now you don’t need to switch between IntelliJ IDEA and Play console anymore. Everything is available right from your favorite IDE. To enable support for Play 2.0, you need to install the plug-in from the repository. 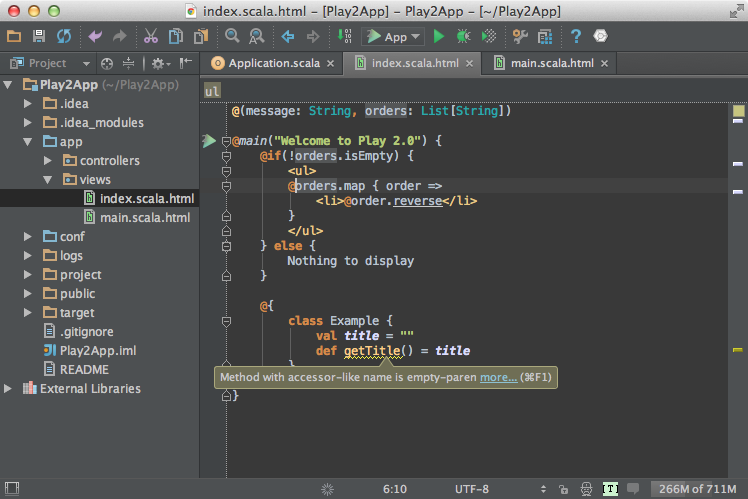 Check also a quick tutorial showing how to create and run a simple Play 2.0 application from IntelliJ IDEA. As always very welcome with suggestions and feedback on the discussion forum and in our issue tracker. This entry was posted in New Features and tagged Leda, Play 2.0, Play Framework, Tutorials. Bookmark the permalink. Nice!! Was trying to figure out this integration last night. Very timely. Thanks. Help me, Play 2.0 plugin does not show up in the repository on intelliJ here? Play framework plugin does not work. I’ve installed it together with another playframework plugin but I do not see any play console in tools and there is no highlightning in the templates of my idea play projects. Dealing with dependencies within Intellij with Play projects is a bit of a nightmare. is there any help for this? When I add a new dependency, it seems as though I have to do all the work to add it, and all the dependent libraries to the project. Is that the case? I’ve tried for several hours to setup intelliJ with a play app but failed. I receive numerous errors, no template code highlighting, etc. I am uncertain as to what the actual problem is. Is there a good step-by-step tutorial on how to setup IntelliJ for Play! apps? The one on the play homepage didn’t help. Where can I find Play console in IDEA for Play 2 framework? @Lev, it is supposed that you don’t need it anymore, and the IDE provides what you need (e.g. run, compile, etc). Is there a way to generate ER diagram of Play 2 model? Play 2.0 plugin does not show up in the repository on intelliJ. Why? How to debug Play 2.0 application with IDEA 12? When I run “Debug” command it acts the same way as “Run” starting Play on a usual port, but not on Debug Port. Is it possible to debug play 2 apps with IDEA? Actually it seems not to work with Play 2.1, but will it soon ? 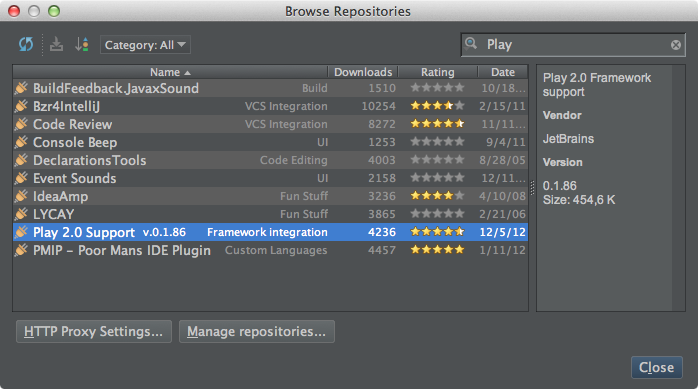 I am having the same problem as @Egor: Play 2.0 plugin does not show up in the repository on intelliJ. Please respond to us. One of the reasons why Play 2.0 plug-in will not show-up in the repository is the edition of IntellJ IDEA you are running. It is supported in Ultimate edition only. I am student planning to apply for an Academic license for IntelliJ idea. Will this verison include support for the Play framework as that is what I need IntelliJ for? @Brian, sure. It will include everything what is available in IntelliJ IDEA Ultimate. I am having a problem when I attempt to create a new Play framework project. I am evaluating IDEA 12. When I attempt to create a new Play project I do not see it as an option. Yep, play support seems to be broken. Using play framework 2.1 and IntelliJ build 123.169. Currently evaluating Ultimate Edition and will not be able to purchase license until I can evaluate play support. Hopefully JetBrains can update us as to when it will be fixed. @GJ Says: Have just checked Play support on 128.18 and everything works smoothly for me. Could you please add more details to the ticket, or try to double check if you have updated the plugin. I also tried uninstall and reinstall of IDEA 12 Ultimate (and EAP) no success with Play support…I also tried to update the Play support plugin by downloading it and installing it via “Downloaded Plugins” feature..with no success either…So I am going to hold off recommending IDEA 12 Ultimate for my company. Hi, just installed latest version from website. Chose all default settings when installing. Checked plugins screen to ensure Playframework was checked. When I select New Project I am presented with the list of project types but Play is not listed. If I open an existing play project I don’t get any of the play features. Same with me as with last couple of posters. I am on latest 12.0.4 Ultimate and trying to create/import Play 2.1.0 with no luck. Create new project shows no Play module and when trying to import existing Play project ( which has been morphed into Idea project with stb) gives me message no frameworks were detected. Hope this is going to get fixed asap. I have the same problem – no Play Module available in Create New Project. Play 2.1.0 and Ultimate 12.0.4 (evaluation). I can’t buy unless this is fixed. Any news on a solution? I have the same problem, no Play module shows in Create New Project. I bought IntelliJ purely for its Play support so this is a critical issue for me. What is the latest information on this problem? +1 for dependency management problems. I add a dependency to the ApplicationBuild project. Play2 is happy but Intellij does not update the module libraries leaving a trail of red underlines in its wake. What am I supposed to do? Is Play 2.0 plugin available in Community Edition? Installed the Play 2 framework plugin from the repository as I had no “Play 2” option in the project wizard from start. Other than that this should pretty much be the bare bone, clean install test. I’m at loss. Like others I heard about the great play support in IntelliJ and wanted to try it out, looks like I’m back to vim. @Erik, which version of Play 2 plugin did you try? Hold that – I don’t know how to get it to generate code for new views. In trying to figure it out, I removed the dozens of SBT-…jar libraries which were created by the new project wizard (thinking my dependency list should look like the tutorial), but now I can’t figure out how to add them back. Isn’t there a proper facet for play support? or is there just the initial library setup for a scala module? It would be nice if I just added (or it autodetected) a facet for play where I could generate the library dependencies – and if a project build would generate the managed code. Ignore my comments – I updated the plugin to the latest nightly build, deleted the .idea and .idea_modules, recreated them with play idea (from the terminal/shell), had to fix up the generated scala libraries in the dependencies in IntelliJ, and it seems to be working great. My project has two modules now – one which builds the app directory, and one (with a -build suffix) which is building the generated code. seems to be working fine. Forgive the inexperience, just starting to learn play – as well as the play support in 12. For me the solution was that I let intelliJ download and install PlayFramework 2.1. After this I was able to switch to my downloaded version. So when you create a project on the right side there is a Download button. You can select from there the play version you want to install. Select 2.1 and create the project. After this I was able to manipulate the version of play to that of the one that I downloaded manually. I hope this helped somebody at least one person that it was worth it. How I install the plugin? It’s now 2015, so this post is a few years old. It seems that the Play plugin is now consolidated with the Scala plugin. I’ll be checking out that tutorial; maybe that’s been updated to something more recent! Found this by looking for “how to run play project intellij”.